How Much Does Zoom Teeth Whitening Cost? Zoom teeth whitening is an in house treatment to whiten your teeth. This is a cosmetic treatment that can greatly enhance the aesthetics of your teeth when you leave the clinic. Why Would I Want To Have Zoom? 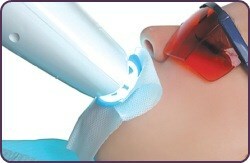 If your not happy with the shade or colour of your teeth, then zoom may be an ideal treatment for you. Zoom is an in house, in chair treatment that uses the power of the zoom laser to brighten and whiten your teeth before you leave the surgery again. The treatment takes approximately an hour and half, but does vary from patient to patient. For the best of both worlds with whitening you teeth, the combination whitening treatment can be effective. Combination whitening utilizes the fast effecting whitening properties from the zoom treatment and then doubles up with the longer lasting properties of home whitening. Is Zoom Right For Me? If your not happy with the colour of your teeth and would like them to be brightened up, then zoom may be a suitable treatment for you. We offer free consultations so we can asses your teeth and discuss what options will be the most suitable at meeting your needs. As we age it is natural for teeth to become slightly discoloured. Also, it is very dependant on our life style, for example, if you drink lots of coffee, teas, red wine etc it can speed up the discolouring process. Once you have had your teeth whitened, it is important that you limit any dark foods and drinks as the effects of your whitening may not last as long. If you are interested in improving the aesthetics of your teeth, please do not hesitate to call us and book your free consultation today.